As part of a Windows 7 deployment I wanted to automate the naming of computers using the Dell service tag, prefixed with “D” for desktop, “L” for laptop and “O” for other. Renaming the computer proved to be the difficult part. You can use WMI and the Win32_ComputerSystem class to rename a computer, but I didn’t have much success using this in the task sequence. PowerShell and WMIC commands use the same underlying technique and also failed. I believe the difficulty was caused by the computer being joined to the domain, rather than being a member of a workgroup. I found a utility called WSNAME http://mystuff.clarke.co.nz/MyStuff/wsname.asp, which is capable of renaming domain joined computers using the Windows APIs. Unfortunately, WSNAME is not native 64bit compatible and I needed to deploy Windows 7 64bit using WinPE 64bt. The final solution to rename the computer consists of a vbs script which detects the computer type and Dell service tag. The new computer name is passed to WSNAME which renames the computer using a domain account with a hashed password. Finally, the vbs script reboots the computer. 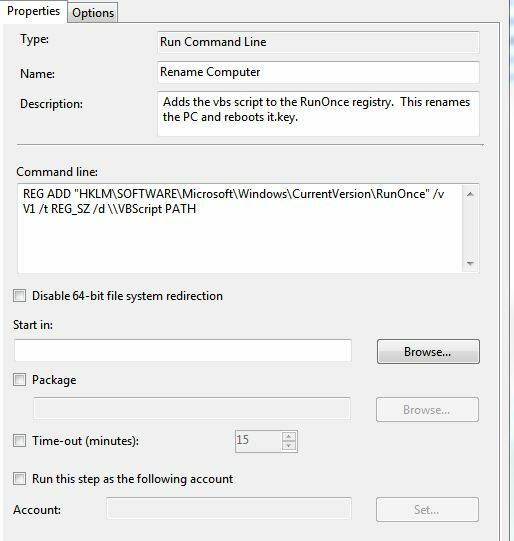 The trick to make it work is to add the vbs script to the runonce registry key through the SCCM task sequence, followed by a reboot task, which completes the task sequence. When Windows starts following the reboot task, the vbs script runs and renames the computer. As the vbs script is run by Windows 7, rather than WinPE, wsname.exe will work as Windows 7 64bit has WOW64 support, whereas WinPE 64bit does not. ‘Is the computer a VM? To add the vbs script to the runonce registry add a Command Line step to the task sequence and enter the command as shown in the screenshot below. Update the command to include the appropriate path to the vbscript. This entry was posted in System Center Configuration Manger and tagged BIOS, Dell on July 13, 2012 by richardstk.